Investigators tracked down Jeremy Ray Ford by using evidence from the scene. 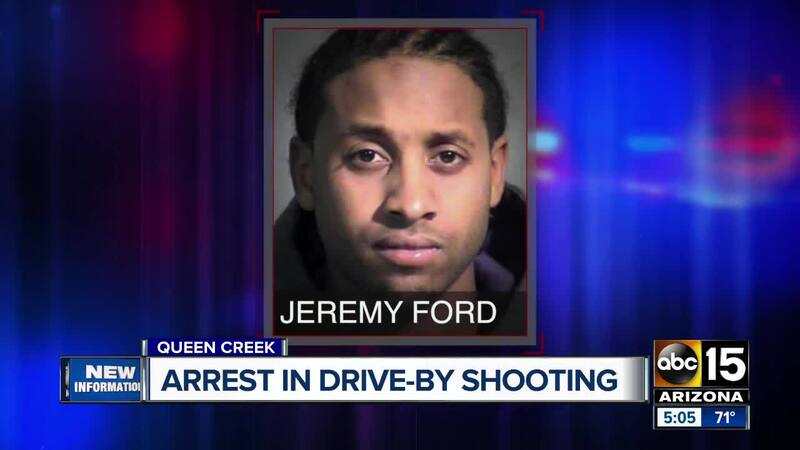 QUEEN CREEK, AZ — A suspect has been arrested in connection with a drive-by shooting Tuesday night at a Walmart in Queen Creek . Maricopa County Sheriff's deputies were called to investigate a shooting at the store near Rittenhouse and Ellsworth roads around 7:46 p.m. When deputies arrived on scene, they found a man who had been shot multiple times. Detectives used video and other evidence from the scene to identify the suspect's vehicle. Deputies were able to identify the vehicle's owner as 27-year-old Jeremy Ray Ford. Authorities located Ford, who was booked into jail on two counts of felony aggravated assault and one count of felony drive-by shooting. Deputies say Ford admitted to shooting the victim and told authorities where to find the gun he used. The victim, who is not being identified, is in stable condition at this time.